Combat operations in a city area and the preps for them have a whole host of different factors for you to consider. A green beret weighs in on the issue of urban defense considerations, combat operations, and the preps for them. 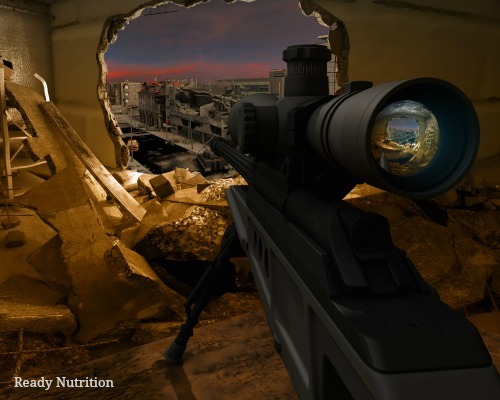 Here we go, ReadyNutrition Readers, with “Part 2” on the series on prepping your home turf for battle. In Part 1, we covered the things needed for those in a rural and suburban setting. Now we’re going to focus our efforts on similar measures for those in densely-populated suburbs and cities. As you have probably deduced, combat operations in a city area and the preps for them have a whole host of different factors for you to consider. In the service, such operations were referred to as MOUT (Military Operations in Urban Terrain), and there are a number of military publications you can research online to cover such a broad topic. `There are a number of these factors that need to be mentioned. We mentioned some terms such as cover and concealment in the first article. To refresh, cover protects and can hide you, concealment usually hides you with a slight protection factor in many instances. In an urban environment, there are many structures in a firefight to provide you with cover, such as brick or masonry buildings, and also large public works structures such as tunnels and concrete subway and sewer accesses and portals. Due to the increased amount of structures that are very durable in nature, cover is more readily available in a city, and can also by its nature conceal you. Conversely, this deals with the exterior of buildings. The interiors are different matters. Drywall (the universal construction “substance”) provides minimal or no protection from small arms fire. Another drawback in high rises or townhomes are the windows…great for light, but not great for either providing concealment or cover for you. The greatest challenge that you will face, however, is in the numbers of people you encounter in an urban environment. “World War Z,” the movie with Brad Pitt has an excellent illustration of this toward the beginning of the film when he and his family are in New Jersey. Watch the scene, and realize the sheer amount of humanity moving around you during a disaster, each one of them desiring the same things as you, with the same needs as you. Now to factor into all of this is where you live. Remember, if you live in a really big city (such as New York or Los Angeles), your primary consideration should always revolve around your city being a target in a nuclear war, in which case most of these considerations mentioned in this article are secondary in nature to what you will face with that. In a collapse, you may be on the 30th floor of a 50-story apartment building: what will you do without any power, water, sewage, or temperature controls (AC or heat)? How secure is that front door into your abode, and do you have the materials and resources necessary to blockade it and re-secure it if a forced entry is made? Who are your neighbors, and what is their disposition? What would their disposition be if all of a sudden everything collapsed? Can you get out of there, via a set of stairs if the elevator is out, or a fire escape? What is your plan to E&E (escape and evade) if the living situation becomes untenable? Is there an immediate common area that you can escape to and secure as a temporary hideout if your primary residence is compromised and/or overrun? How easy is it for the neighbors to “reach out and touch someone,” …not by telephone, but (for instance) jump from their balcony to yours and smash in your sliding glass door? Those once-friendly neighbors…can you keep them out? Preparation and planning are the keys here. You need to have a plan of escape from that type of residential structure. The exfiltration needs to be secure, silent, swift, and successful….in that order of importance for the first three with the last one being a goal. As an example, you may have an abandoned storage building made of stone one block from your residence. Here’s what you do. You need to watch the building for a whole day (that means a whole 24-hour period), and one of those days needs to be on a weekend…. this will show you what “creatures” normally frequent this locale and give you an idea on the human traffic in and out. Remember: if you recognize it as a safe haven, another family will see it as such as well. You must keep this in mind, as “your” safe haven is not yours until you make it yours. English Common Law of Property and Chattels goes right out the window, along with the Marquis of Queensbury Rules for Boxing when your neighborhood “morphs” from “Happy Days” to “The Planet of the Apes.” You may even consider stashing a few essentials (that you can afford to lose) and prepositioning them in this building/structure, such as a quickly-accessible cache. “Goodness gracious! Somebody else’s property!” you may say. I wrote “consider it,” and I am not advocating breaking any laws or doing anything illegal. I said to “consider it,” and reflect upon such. This article is information to provide you with food for thought to consider possibilities. “When the time comes,” is the key phrase; therefore, without going any “deeper,” you had better be aware of not just what you can do, but what you will do to protect and provide for you and yours. I know, I know…if you watch the potential secure location…you’ll miss the baseball doubleheader on Saturday, right? Guess what? We’re talking about something that can save you and your families’ lives. This “stuff” is for real, and needs to be practiced and followed in earnest, not just paid lip service to or drilled in a half-hearted manner. If your preps and training are not priorities, then neither is your survival. You can also pick up a range finder to measure distances from your balcony. Research any of the Infantry Soldier’s Handbooks to see how to emplace a shooting position within the window of a structure and set it back so as not to silhouette yourself. The exercise is beyond the scope of this article. If you wish to know about such subjects, then ask for what you want in the comments section and I will be more than happy to consider your topic for a future article. To move to any of these fall back positions inside of your own building or outside of it, you need to prepare the ground, and practice moving back and forth with your family. Again, I know there will be people who may be able to see you. Consider it a test and/or a training exercise. What better way to simulate something? Guess what? When the SHTF, you’ll have a whole bunch of people that you need to shield your actions from and avoid their cunning gazes. Practice makes perfect. get right with God ! Bless you all. Agree completely don’t know if you are familiar with The Harbinger but Cahn was on the Bakker program today & all last week ..
DROP and GIVE ME FIFTY, SON!! !